Three Dal researchers are receiving new funding to acquire the cutting-edge tools needed to conduct world-class research. This morning, at the University of New Brunswick, the Honourable Kirsty Duncan, Minister of Science, announced an investment of more than $51 million for 223 research projects taking place at 39 universities across Canada. Christopher Algar, Zhenyu Cheng and Mita Dasog were included in the national announcement, and will receive a total of $350,000 for their research projects. The funding is provided through the Canada Foundation for Innovation's (CFI) John R. Evans Leaders Fund. It is designed to help universities attract and retain the best and brightest researchers from around the world by giving them access to cutting-edge research infrastructure. Matching funds were also provided by The Nova Scotia Research and Innovation Trust (NSRIT). 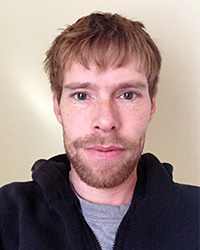 Dr. Christopher Algar, an assistant professor in the Department of Oceanography, is interested in how nitrogen cycles flow through coastal waters — a key factor in ocean productivity. Nitrogen is an important component of the fertilizer used on fields to yield better crops. When nitrogen that runs off land into rivers reaches the ocean, it promotes the growth of marine microbes like algae. In recent decades, the increased nitrogen flowing into coastal waters has shifted how marine ecosystems operate, leading to larger, more frequent and sometimes toxic algal blooms. But when these marine microbes eventually die and sink, they decompose. This decomposition consumes oxygen from the surrounding water potentially causing “dead zones,” or anoxia, in deep water. However, some marine microbes living in the sediment found on the seabed can convert the form of nitrogen used to promote algae growth into a form of nitrogen that life cannot use at all. The process is called denitrification and it’s important for maintaining a chemical balance in coastal waters that can sustain fish and marine animal populations that depend on oxygen to survive. Correctly representing these biogeochemical processes in models is necessary for understanding how sensitive the coastal environment is to increased nitrogen inputs. “We want to understand how sensitive a certain bay or harbour could be to these phenomena,” says Dr. Algar. 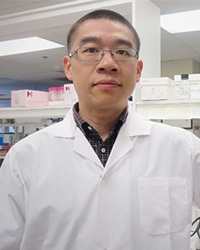 Dr. Zhenyu Cheng’s laboratory at Dalhousie Medical School is one of only a handful in the world that focuses on defense responses against a bacterium called Pseudomonas aeruginosa in both plant and animal models. It’s long been thought that microbial pathogenesis invades plants and animals in similar ways. Dr. Cheng, who was trained as a plant biologist and is an assistant professor in the Department of Microbiology and Immunology, is trying to figure out how to prevent the P. aeruginosa bacterium from taking hold in the body — especially in those who have immune deficiencies. The microbe is particularly dangerous for people living with cystic fibrosis (CF). In CF patients, the pathogen causes persistent lung infections that lead to progressive destruction of lung tissue. Another line of research in Dr. Zhenyu’s lab is to try to understand how P. aeruginosa develops resistance to treatment. The goal is to better design and screen for compounds that will enhance the effectiveness of existing antibiotics. 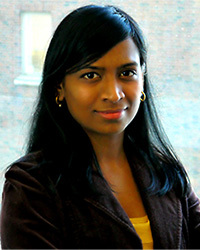 Mita Dasog, an Assistant Professor in the Department of Chemistry, and her research group are exploring materials for use in clean energy application. In contrast to traditional solar cells systems that convert sunlight to electricity, Dr. Dasog works to develop materials for use in devices that convert sunlight to chemical energy — precisely what photosynthesis does in nature. Mimicking photosynthesis with synthetic inorganic materials instead is an up-and-coming approach to harvesting solar energy. Artificial photosynthesis can, in principle, create fuels like hydrogen directly from sunlight. It could also provide a scalable technology for the carbon-neutral production of fuels needed for ships, aircraft, and heavy-duty trucks. A first step to this requires the materials that can absorb sunlight efficiently. Dr. Dasog explains these materials should meet certain standards to become successful and cost-effective in application: they would have to possess optimum bandgap to absorb sunlight in addition to being stable, earth abundant and non-toxic. Many existing materials meet two, maybe even three of those standards, so Dasog and her team are focused on manipulating current materials at the nanoscale so they can meet all these criteria. In addition, the Dasog group is interested in developing brand new materials. “We’re trying to create materials that are more efficient and robust than those found in nature,” says Dr. Dasog.